Cecilia Moreschi, author, playwright, stage actress, director and theatre teacher, was born in 1971 in Monterotondo and currently lives in Rome, Italy. In 1995 she graduated in Literature and Entertainment Studies at "La Sapienza" University of Rome. Since 1999, she conducts theatre therapy sessions in one of the most important Italian institution for children with hearing and learning impairments, and also theatre courses for young students in schools. Her first books are “Se ci fosse stata la pace” (If there had been peace), 2006, and “La storia del Teatro va in scena” (The story of Theatre goes on stage), 2007. Both titles contain “theatre for kids” plays written by the author working with her students. 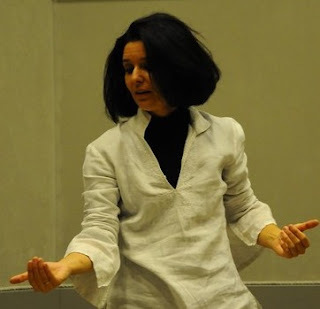 Since 2005 she organizes and perform inside “The Gift of Diversity”, Italy Theatre Storytelling Festival in Rome. Since 2016 she works with "La Sapienza" University of Rome by conducting the "Dramatization" Course for students of the II Year of the Bachelor Degree in Speech Therapy. At the end of 2018, after more than twenty years of study and fieldwork experience, she named her work as Logoteatroterapia (Logos-Drama Therapy).